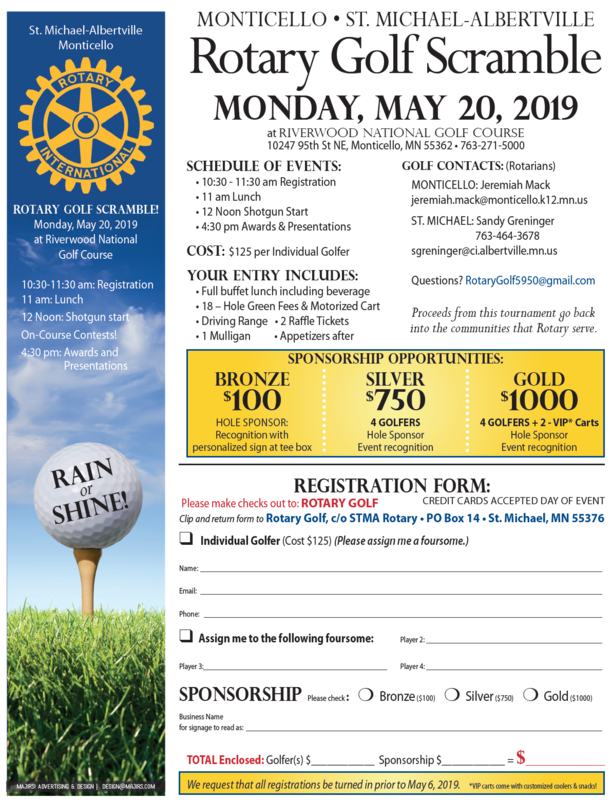 Please join Rotary on May 20th for a fun day of golfing to raise money for the community projects that STMA and Monticello Rotary does. 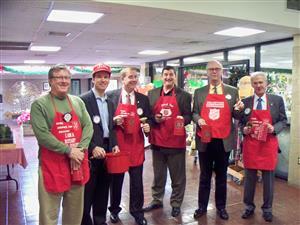 Help us reach our mission of Service Above Self. 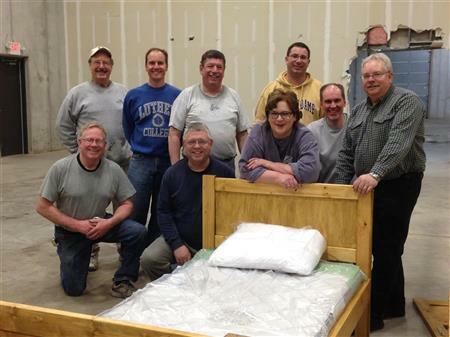 Members of the St. Michael-Albertville and Monticello Rotary Clubs along with the Crisis Nursery and Family Youth Community Connections (FYCC) have teamed up to provide beds for kids who otherwise would not have a bed to sleep in. 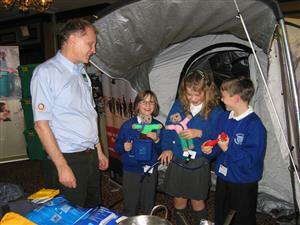 There are hundreds of children in our area who sleep on a floor rather than in a bed. 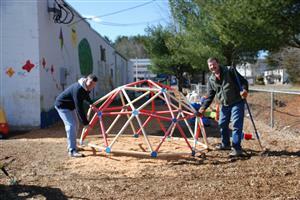 We are providing these beds to the kids at no cost, but to the kids who get the beds they are priceless. The children apply via Family Youth Community Connections (FYCC) who coordinates with Crisis Nursery, Rivers of Hope, Wright County Human Services, and the School Districts of Wright County for this program. The local Rotary Clubs have been successful in securing additional donations of bed frames, mattresses, bedding sets, plush animal toys and books to help us stretch the dollars that our clubs can contribute to this very exciting project. However, there is still a need and we would be happy to accept the donations of cash, bedding, pillows, full size sheet sets, full size blankets, and full size comforters provided the items are NEW. Anyone that would like more information about this project is welcome to contact any Rotarian from St. Michael-Albertville or Monticello or Call Sandy from FYCC at (763) 416-7912. Donation drop off sites are Courage Kenny of Albertville, Tree of Life, Financial Security Bank, and Community Development Bank. 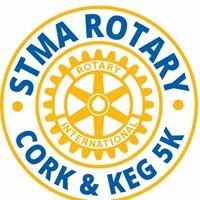 STMA Rotary strives to improve the quality of life for our community members and to meet it's needs through targeted projects. Projects include Beds for Kids, Student of the Month, Cork & Keg 5K fundraiser, Annual Holiday Tree Lighting, Fish Fry fundraiser to support WEB, Library project in Cambodia, Wakami Village project in Guatemala, Little Libraries and water fountains in our parks, Read Across America, Adopt-a-highway, and many more. We support local programs and organizations, such as STMA Robotics Team, Crisis Nursery, FYCC, St. Michael Royalty, Albertville Royalty, Super Mileage Club, Open Streets, Shelter Box, student scholarships, and ending human trafficking. 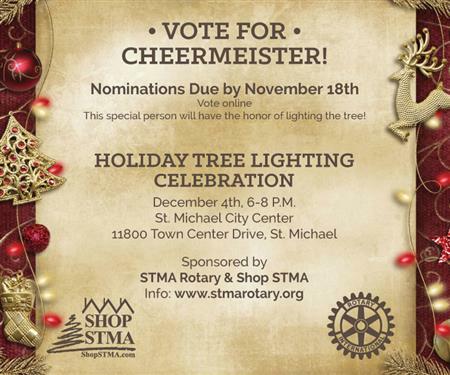 The St. Michael-Albertville Rotary Club and Shop STMA are seeking nominations for St. Michael’s “Holiday Cheermeister.“ The Cheermeister has the honor of lighting the St. Michael holiday tree during the 6th Annual Holiday Tree Lighting Celebration December 4 at St. Michael City Center.